A tour of Tel Aviv provides an opportunity to see and understand so much about the second largest city of Israel and to know the fantastic people who live there. The other motivation to visit is to delight in a city that offers exquisite food, a dazzling nightlife, and average tree-lined boulevards that stretch up to the Mediterranean Sea. The people of Tel Aviv will let you feel it’s the best city on earth, so spend a couple of days and discover why. Visit the routes out of the ordinary and find unforgettable landscapes, busy parks, fertile plains, refined flavors, rich history and culture. The famous Jaffa oranges were named after Tel Aviv’s old town, which is known as Jaffa. They are grown on the fertile plains of Sharon. The best way to see and learn about Tel Aviv is to experience it. The best times to visit the city are from March to April and September to November. The spring and fall season is the ideal time to check out the tourism spots while enjoying the average temperatures and moderate costs of flights and hotel deals. Notwithstanding the extraordinary hotness, most foreign travelers head to Tel Aviv during the summer months (May – August), dead set to return home with a nice tan. In the middle of May and August, expect price increases on package tours and hotel lodging rates, because almost everyone wants to escape the humid weather in the city by checking into a hotel or heading to the beach. The winter months (December – February) likewise see a rise in tourist arrivals as visitors from the northern nations (especially in Europe) come for a holiday and experience tolerable cold atmosphere in Tel Aviv. Tel Aviv has easy to manage weather conditions, making it ideal to explore any time of the year. Straight from the beaches of Tel Aviv to the port of Old Jaffa you can have a great time taking the 20 minute walk along the sea, otherwise transport or ride a taxi if you do not want to spend more than 6 euro. You will find yourself in a market at once, it's beautiful and there are bizarre objects and peculiar kitchen gadgets you can purchase. After a round of shopping if you want to stop there for lunch, there are many good cafes that can be found in the streets around the market where you can also shop for fashion clothes with designs that are really interesting. The old city of Jaffa is the original settlement of Tel Aviv that went through a period of neglect after being proclaimed as the independent state of Israel. The money from the Jewish National Fund was invested in the colonization of the wild territory to the north, the modern city of Tel Aviv, or the "Hill of Spring". Jaffa was placed at the center of a recent renovation project and is back in its second life as a center of fashion and the arts, with artisans who exhibit works of art and collectibles, with trendy restaurants settled in the old structures of the port that is now highly modernized. On your adventure through the narrow streets of cobbled stone, absolutely do not miss the opportunity to visit the square with the wonderful view on the promenade of Tel Aviv and the picturesque monastery of Saint Nicholas, the artists' quarter, upstream of the hill, the landmark house of Simon the tanner, in which, at the time of the Bible the apostle Paul was housed and don’t forget the flea market behind the clock tower. The Palmach Museum is interesting from the point of view of history and shows what happened in the 40’s in the independence struggle that led to the birth of the state of Israel. All this is shown with panels, objects, and a room showing the story of the Palmach army in the 1948 war through a "fiction movie" filmed with actors with a stake in each room that follows the story of the platoon. All of these are recounted through the halls of the museum. Although this learning solution may be debatable, it is very informative, especially for the young people who frequents this museum and must be educated about what happened during those troubled years of Israel. The presentation is done in both languages, English and Hebrew. The museum’s goal is to present the role of the Palmach in the birth of the state of Israel. It is interesting for both adults and children. This museum is a must, because you will learn a lot about these brave soldiers from all sides who made everything to make Israel free and the Palmach volunteers who have sacrificed a lot. There is a lot of emotion and pride in this important place of memory. There is also a song dedicated to them in this museum. A word of advice, a reservation is prerequisite and must be made in advance online otherwise you will remain stuck in the entrance gate. The Tayelet Beach is located in the northern part of Tel Aviv and frequented by tourists for its beautiful beach infrastructure and promenade. The long stretches of the beach are adjacent to the walking path where anyone can have the possibility to practice all kinds of marine sports. Along the promenade you will find; free fitness areas, a number of courts for beach volleyball that gets lit until late at night, bike path, beaches equipped with sun beds and umbrellas, bars, restaurants, benches, and gardens. A number of hotels of various levels overlook the promenade The general appearance is that of a cozy beach along the Mediterranean Sea. It is always filled with many young and cheerful people. Going to Tel Aviv and not taking a stroll on the boardwalk is impossible and meaningless. It stretches from the promontory of Old Jaffa and its port to the south up to the town of Namal, the old port of Tel Aviv to the north. This promenade is about 6 km long and classified as the living heart of the city. On one side, you can enjoy the white beaches that are always lively at any time of the day or night while on the other side you can see a slew of other high-rise buildings and hotels that draw a skyline that resembles the city of Miami. Here you will meet street artists, people running, skating, biking, sip cocktails, eat and have fun in the thousands of dining places that dot the beach and promenade territory of Tel Aviv. The Yitzhak Rabin Center was first opened in 2010 and recognized as one of the best historic museums in Israel. It is built like a spiral where on one hand the life of Yitzhak Rabin is presented while the other side shows the history of the State of Israel, from its origin up to the present day. Besides the spiral presentation, you can walk on a path which is located on the exhibition floor and illustrates the events taking place simultaneously in the world. A presentation that allows you not only to understand the history of the state of Israel and one of his best men, but also to be able to place their story in the global context. The story behind the photos is best narrated with the help of an audio guide. Pay particular attention to the architecture of the building. The wings of the stylized peace dove is an architectural masterpiece. The Tel Aviv Museum of Art is a contemporary cultural museum that has the works of; Picasso, Van Gogh, Kandinsky, Chagall, Ernst, Torres García Miró. There is also a miniature collection donated by the Helena Rubinstein Foundation. The museum was founded in 1932 and is now considered one of the greatest art museums in Israel. It is divided into many sections like; Israeli art, modern art, contemporary art, photography, drawing, prints, design, architecture and artworks done by young artists starting from the ages of 16 to 19 years old. In addition to these departments, you will also find a pleasant garden of statues and youth area. Initially, the museum was opened in 1932 in the Dizengof House, located at No. 16 Rothschild Boulevard. In 1971, the museum building was opened in its current location on Boulevard Shaul Ha-melech. The expansion of the museum made it more spacious and add other activities including performances of classical music, jazz, film, lecture series, children's shows, etc. In November 2011, a new wing was opened. This building has five floors with a central courtyard which connects all the exhibition spaces for a better appreciation of the art presented here. Given the constant incorporation of artwork from various artists who keep bringing in their work for exhibition, it was decided to build a larger section of the building that is now called the Helena Rubinstein Museum that opened in 1959. Every tourist who likes history and culture must visit this museum. The Independence Hall Museum belonged to the first mayor of Tel Aviv and the construction of the building was also dedicated in her memory. In this same place is where Israel's independence was declared on May 14,1948. It is advisable to go with a guide to understand the historical importance of the place. If you go to Israel for the first time a visit to this place is mandatory. It is where David Ben Gurion read the declaration of Israel’s independence. It is an introduction to the recent history of the formation of the State of Israel. The museum also has a 20 minute video recounting the events that led to the Declaration of Independence. It is one of two museums that are in the Dizengoff house at No. 16 Rothschild Boulevard in Tel Aviv, next to the Bible House Museum. The house was built in 1910 by Meir Dizengoff, the first mayor of Tel Aviv. In the center of the museum is the room where independence was declared. In 1978, after the celebration of 30 years of independence of the state, it was decided to restore the room where independence was declared. Since then, the building shares the Independence Museum and the Museum of the Bible on the upper floors. In the Old Tel Aviv Port Area it is nice to stop in the evening to eat or drink in one of the many clubs in the area. It is much frequented by Israelis who come together to spend a few carefree hours. The site of the old port of Tel Aviv is now abandoned and now full of shops, bars, and restaurants with a great walk in the wood on which you can go strolling, biking, skating or just watch the waves of the Mediterranean Sea. It becomes lively and popular in the evening by the inhabitants of Tel Aviv and tourists who gets immersed in its informal and relaxed atmosphere. It is located in the extreme north of the boardwalk. The hangars of the port have been renovated and used as bars, dining places, and stalls for shops. The Neve Tzedek is billed as the most fashionable district in Tel Aviv. It is a district that corresponds to the first settlement of Tel Aviv and has remained intact and filled with foreign boutiques, art shops and many restaurants with affordable dishes. It is quiet and pleasant to stroll in the evening. There are lots of very unusual houses, flowers, and a lot of walking to do along the manicured streets that has a large selection of cafes, designer shops, interesting jewelry and clothing. 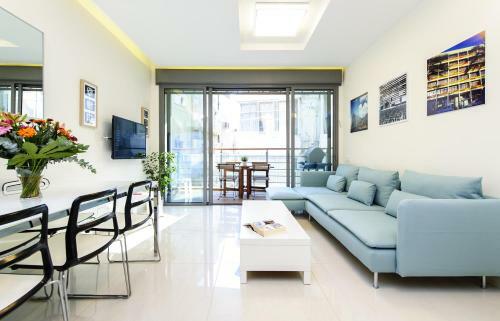 The Neve Tzedek is definitely worth a visit during a trip to Tel Aviv. When in Tel Aviv, try to watch the play "Not by Bread Alone" in the Nalagaat Center. Tickets can be bought at the center on the day of the performance. The presentation is shown in Hebrew with English subtitles. The actors in this play actually “play” themselves, they are ordinary people who have lost sight and hearing, some of them cannot see while the others cannot speak. But everyone has their own life story and dreams which they share with the audience. You will see good chemistry of the actors to each other, their unity on the stage (as they pass each other their stories before the next actor), their good dreams that may never come true - all this unforgettable performance makes the play one of the best reasons to visit this center for arts and culture. The play touches deeply. Throughout the action, the actors bake bread and in the audience sends a wonderful aroma of baking bread. After the performance, you can try the bread and have a meet and greet session with the actors. The Yarkon River and Park Hayarkon is a very extensive park with many attractions starting from the river, the outdoor gyms, the ability to have picnics, cycling, there are tennis courts, a water park, a chance to go on a boat, in short, it has a bit of everything and truly deserves to be visited when in Tel Aviv. If you arrive on a bicycle by the waterfront, you have the opportunity to enjoy the beautiful view of the harbor and the old and new establishments located at the last stretch of its premises. It is always animated by the ever-present families with children who use the many play areas and in the central hours is permeated by the smell of meat cooking on the grill. The trees are numerous and the greenery is well-kept. The park is a great place for a relaxing moment after a busy day at the beach. The Safari Park (Tel Aviv) is a very good choice to share with your children and a pleasant and surprising experience to try when in the city. Just after entering, you can start to explore the area in which the animals are loose and where you could see them really close. They have ostriches, zebras, hippos and rhinos. After reaching the internal parking lot, you can start the walking tour to observe some other species of animals living in the zoo. It is a great experience that you can enjoy for over three hours until closing time at 4pm. As a suggestion, it is best to arrive as early as possible to allow more time to visit and to see it several times. Normally, the park opens at 9:00 am and close at 4:00 pm in the weekends. During the summer season, the closing time may be extended until 7:00 pm. The Ilana Goor Residence and Museum is the official house-museum of the artist Ilana Goor that also served as a former hospice for pilgrims visiting Jaffa. It is made with the typical local stone and has an accumulation of decaying objects of art, mostly sculptures and art works made of metallic materials, fabrics, ropes, and wood. The library is available on the first floor and has a small corner of knowledge dedicated to humanities, art, and religion. Upon entrance, you will be greeted by a huge and completely cluttered desk with small sculptures. Go upstairs and appreciate his works, and also the works of other artists, beautiful objects, quirky and eclectic furniture on the terrace, and finally have a good view of Tel Aviv City surrounded by lots of plants. If you are in the Old City of Jaffa, do not fail to visit this unique museum.